Stars: Shane Jacobson, Sarah Snook, Alan Tudyk, Coco Jack Gillies, Deborah Mailman, Frank Woodley, Terry Camilleri, Richard Davies, Dave Lawson, Tegan Higginbotham. As local films like Storm Boy, Babe, Happy Feet and Red Dog have shown, the formula for making a successful family friendly film seems pretty simple. All you need is a cute, mischievous animal – preferably a dog – after all, dogs have been the main character in some great films over the years, from the classic tearjerkers Greyfriar’s Bobby and Lassie Come Home to the more comedic Beethoven, and more recently the locally produced Red Dog, which was the top grossing film locally in 2011. For good measure, throw in some cute penguins or other animals, a precocious child, a curmudgeonly older man and lovable rogue, and lots of slapstick physical humour and you have a winning formula. For good measure, add the affable Shane Jacobson (better known for playing Kenny in the box office smash) and you have a sure fire winner. And that’s what you get with Oddball, a film that will almost certainly please those who enjoyed Red Dog. 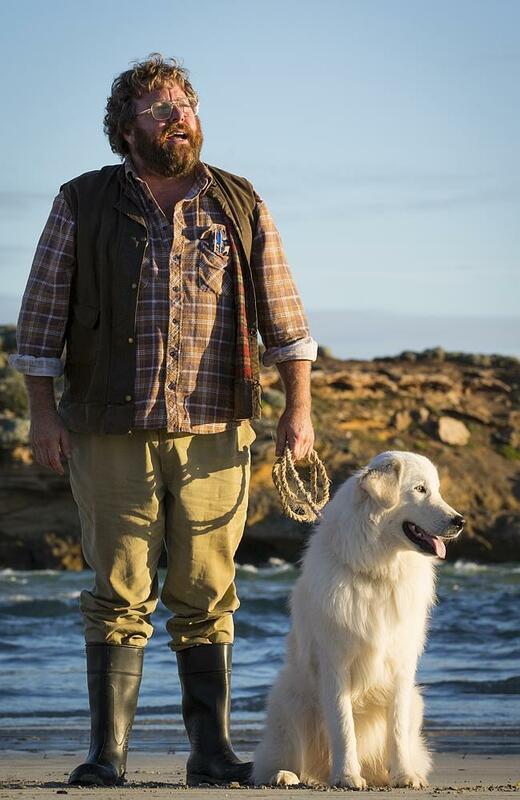 Inevitably there will be many who will compare the lovable Oddball with Red Dog, another wonderful family friendly local film about a cute dog that affected a remote rural community. But this film has a markedly different tone than Red Dog. The film is actually inspired by real events that happened in the coastal town of Warrnambool a few year ago. The small Middle Island, which lay a few hundred metres off the coast of Warrnambool, was the home to a penguin colony. But then some foxes managed to get on the island at low tide and decimated the penguin population. An eccentric local farmer named Swampy Marsh had the bright idea of using his Maremma sheepdog, which protected his chickens from the foxes, to similarly protect the penguins. The idea became a revolutionary conservation project that saw the penguin population survive, thrive and flourish. With penguin numbers declining, the town council is threatening to close the sanctuary down. Local wildlife officer Emily (Sarah Snook) is Marsh’s daughter, and she is desperate to find a solution. Working with his granddaughter Olivia (newcomer Coco Jack Gillies), Swampy Marsh (Jacobson) discovers that his pet dog Oddball is able to protect the penguins. Oddball has a history of running amok and causing havoc within the township, and Marsh has been warned to keep the dog on his property. Marsh secretly stations Oddball on the island overnight, which proves a success in driving away the foxes. However, there are many people within the town who would prefer to see Middle Island used as a whale watching station, which has more tourist and economic potential. Someone is deliberately trying to sabotage the penguin colony, which adds an element of suspense and tension to the material. Chief amongst the suspects is Emily’s latest beau Bradley (Alan Tudyk), an American tourism expert is promoting a maritime themed park that captures and explores the town’s nautical history. Jacobson brings his usual characteristic warmth and charisma, and down to earth style and some gruff, self deprecating humour to his performance as Marsh. His character shares a number of surface similarities to his most famous character, which adds to his winning charm. Gillies has a delightfully confident and precocious persona, and strong presence, and she develops a wonderful rapport with Jacobson. Snook brings a mix of frustration and determination to her role. Rounding out the cast are Deborah Mailman as the town mayor who is sympathetic towards Marsh’s unorthodox proposal, and comic Frank Woodley, who hams it up as the town dogcatcher and Oddball’s main nemesis. Oddball is the first feature film for writer Peter Ivan, who has taken numerous liberties with the story. Ivan has added lots of physical comedy and several subplots to make it more cinematic. The director is Stuart McDonald, who hails from a background in television (Angry Boys, Summer Heights High, etc). He stepped in to replace original director Clayton Jacobson, who left the project over creative differences. Making his feature film debut here McDonald does a superb job with the material, keeping things moving at a fast pace and never allowing the pace to flag. Shot on location at both Warrnambool and Victoria’s Docklands studios, the film is great to look at, with cinematographer Damian Wyvill (West, etc) capturing some superb vistas of the coastline and giving the material a glossy visual style. Audiences will enjoy the antics of Oddball and the generous doses of physical humour, while the cute penguins, courtesy of Seaworld, will win over younger fry.